I am so done trying to figure out what makes Oscar cry. He can be changed, fed, burped, napped, have farted stronger and harder than any grown man I have ever known, and have had a monster baby poop – yet he cries. We’ve tried gripe water, Ovol, probiotics, reflux medication, and fixing the latch 500 different ways. Sometimes he cries during the day, sometimes he cries in the evening, while other times he cries all night long. Though today Oscar really hasn’t cried at all. Yes, today has been absolutely, hands down, utterly and completely the best day ever of my life as a mother to a 5 week old. I’m not counting my chickens, however. You cannot predict a single moment of infant behaviour based on past infant behaviour patterns. That would be far too logical. Surely, if a baby is crying he must be in pain, right? I HAVE NO BLOODY IDEA. So I will just be grateful for every quiet second we have together, and just try to make him as comfortable as possible when he feels the need to cry. 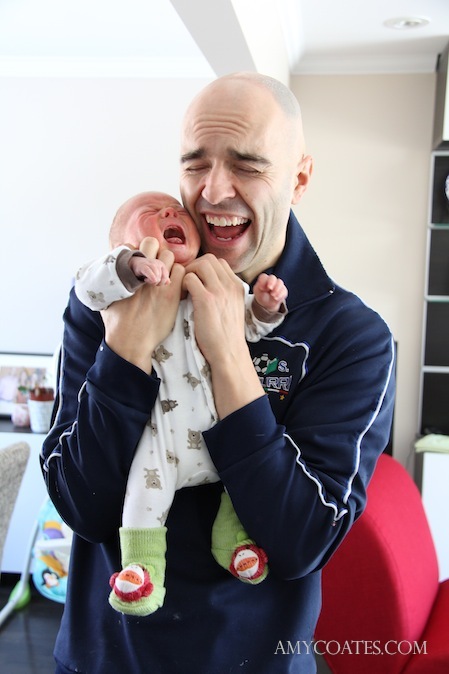 Daddy and Oscar cry together! 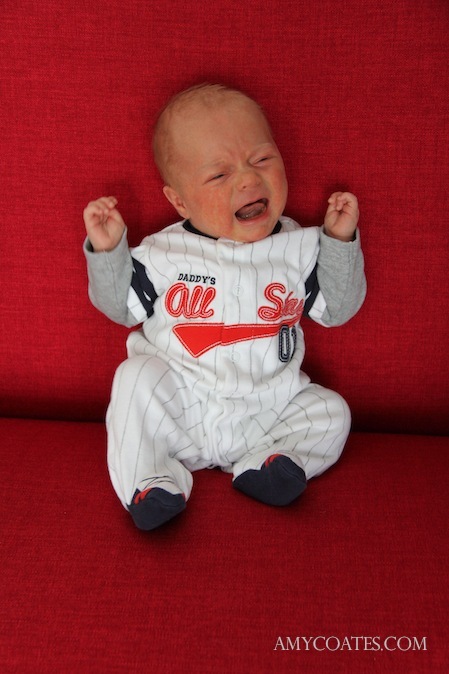 Colic implies there is something wrong with the baby. It sounds like a disease and that something needs fixing. I’m not a fan of the word COLIC. To save my sanity I have chosen to believe in The Period of Purple Crying. Sometimes babies cry. Some cry more than others, but they all cry and not all of it makes any sense to us deducing grown-ups. Peak of crying: they may cry more each week, peak at 2 months, and get better by 3-4 months. Yay. Resists soothing – Ditto the previous sarcastic remark. Pain-like face – Breaks my heart. Long lasting: 5 hours a day or more. Sweet. I can say that I feel extremely relieved since finding this website and I no longer panic every time I can’t figure out what is wrong. You can read more about it at the Purple Crying website. Other than PURPLE, sometimes Oscar has horrible gas. When he pulls up his legs and tries to poo and fart, he’s got gas. Every other time, my best guess is that he has growing pains. I remember distinctly Christmas when I was 5. I had such bad growing pains that I was completely miserable. I don’t remember what I got for Christmas, but I remember how painful my legs were! I can only imagine how an infant would react to growing pains since it is a time in life when they are doubling their birth weight in a few short months. They would probably CRY! All we can do is love them through it and try not to throw them or ourselves out of the nearest window. JUST KIDDING! But seriously…no. No throwing babies. Ever. Don’t even get cross with them. You’ve just got to snuggle them through it. Oscar Lorenzo – A Natural Birth Story. Oscar is One Month Old!